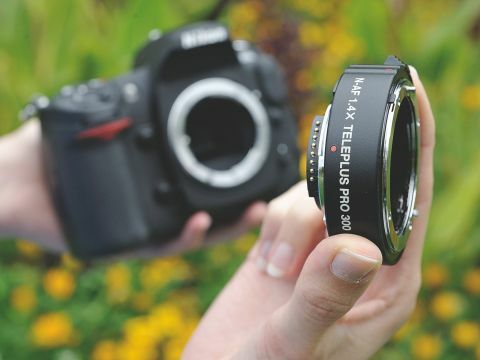 Teleconverters are a convenient way to achieve a new focal length without the cost and physical burden of a new lens, but manufacturer's own models can be fairly pricey. Canon's current 1.4x Extender costs an eye-watering £450, while Nikon's equivalent is priced at around £300. The Kenko Teleplus Pro 300 AF DGX 1.4x, meanwhile, promises to do much the same job, and is available for a far more attractive £180. Although you lose out on the weatherproofing offered by the Canon, elsewhere the model does well to equal its more expensive rivals. Available in Canon, Nikon and Sony fittings, the Teleplus Pro 300 is equipped with contacts to maintain autofocus and metering, although as with any 1.4x converter, it reduces light by one EV stop. The elements inside the lens are multi-coated to help improve light transmission and prevent reflections, and Kenko claims that the design ensures that no additional vignetting is introduced. The teleconverter slots securely onto the camera body, while its large lens release button makes it easy to dismount the optic. The only lens that failed to autofocus during our testing was the Nikkor AF-S 60mm f/2.8 G ED macro lens, although the instruction leaflet explains an AF compatibility issue with this combination and explains that it can still be used manually. Otherwise, there were no issues with focus or metering. As expected, images captured with the teleconverter in place show a slight dip in contrast over those shot without, and details aren't quite as defined. However, chromatic aberrations are kept to a minimum and the overall standard of images is still more than reasonable.